May 2016 - Iowa Interstate Railroad, Ltd. May 2016 - Iowa Interstate Railroad, Ltd.
Th ursday, May 5th, marked a first for Iowa Interstate Railroad as wind blades from TPI Composites departed Newton, IA by rail. Thirty blades, measuring 56.9 meters each, were loaded one blade per two platform flat cars. After inspection, the cars left Newton and proceeded to the Union Pacific in Des Moines to continue their journey south to Texas. In 2015 Iowa Interstate Railroad, Union Pacific Railroad, Union Pacific Distribution Services, the City of Newton, TPI Composites and a major wind OEM worked together to develop a rail solution to move the 189’ wind blades from Newton, IA. The project was not without its difficulties as laydown space, loading equipment, available tracks, and clearance points were all hurdles that needed to be overcome. Plans were put into place, with the cooperation of Key Coop, to utilize a temporary loading site as permanent plans were finalized. (Two new transloading tracks will be built to accommodate the move). 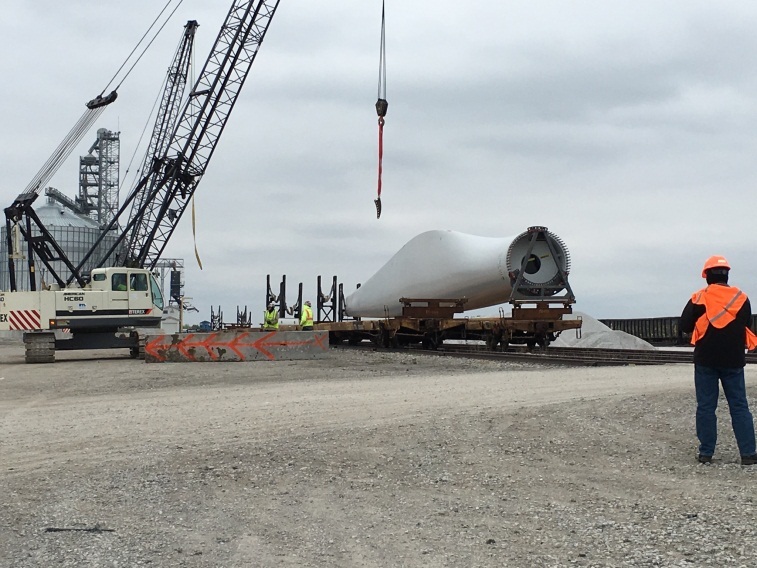 The first blades were carefully loaded on April 29th for shipment. 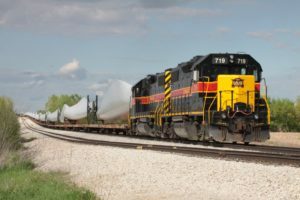 Iowa Interstate Railroad continues to bring value to the Midwest through its nimble service and strategic location with connections to all class one carriers in the US. We are confident that our partnership with TPI Composites and their customers will make shipping the wind blades more cost effective while reducing congestion on the highway and local road systems now and in future years ahead.